I’m mentioning this in case anyone out there wants to follow me non-thought-out idea. A couple days ago, I mentioned that I figured out how to heat “me”, while at home, without spending a lot of money heating our entire home by running our Central Electric Heater. I used one of those metal cones which has a light-socket and an electric cord. You screw-in a lightbulb and can clamp the “cone” to most any extending surface — like the edge of a desk. I used this with a 150-watt Spotlight all last night, while I did my research. I kept the light within about 2-feet of me the entire Time. The parts of me closest to the light were very hot and the rest of me was “sometimes” warm. If I didn’t keep moving a bit, the heat from the bulb would start to feel uncomfortably hot. I used it for several hours. The light only heated “me”. Once I turned off that light, I instantly felt the very cold air throughout our home. I was actually shivering. I can’t remember the last Time I was THAT cold! Getting into bed, on a cold night, is a “cool” to “cold” experience when we DO run our Central Heater. So, last night, when Sylvia and I got into bed, even under our 20-to-30-pounds of Covers, felt “icy”… and I was STILL shivering! After about a half-hour of not being able to get warm, and not being able to sleep, I decided to give-in to Sylvia’s suggestion and just TURN ON THE CENTRAL HEATER! It may have run for an entire hour before turning off but it continued to run, off-and-on, throughout the night. So we didn’t get much sleep. Even when the alarm went off in the morning, I STILL couldn’t get warm! So all the electricity we saved earlier, was now spent… and then some. I want you to be comfortable. If you need to stay warm, just run the Heater. If you think we’re spending too much money on electricity, don’t worry so much about it. I’m taking care of you. You’ll see that our needs will be met as we go. So if you have someone in your life (on EITHER side of the “Veil”) who cares about you, they are probably guiding you… placing Signs and “coincidences” along your Path. It’s just up to each of us to tune-in to them, trust their love and give their “nudgings” some respectful consideration. For the 1st Client (in December 2017), her Higher-Self took her to “the Event”: “It’s going to be huge. She’ll be at home. She’ll be awake. She’ll be looking out the window. She’ll be watching it come at her. It’s all different colors and it looks like a wildfire. Like smoke. Color smoke, rolling in. Huge. Miles high. It’s going to lay her down. Everybody’s going to need to lay down. She’s going to be vibrating. It’ll be affecting everything physically. It will not just affect humans but the whole planet. It goes through everything. It looks iridescent. Like colored cellophane. Rainbow smoke… It changes her on all levels… It changes the sky.” The Client lives in the Pacific Northwest and she sees “the Event” coming from the South, during the afternoon. The sky becomes an iridescent lavender color. The Client will stay on the Earth but the Earth will be in 5D. The Currency Change will happen after the Flash. When asked “when will this take place”, the Higher-Self said 3-to-6 months but the Client though she heard the word “March”. She can take her family and her dogs… to the new Earth. Animals are not eaten. Money is not needed. 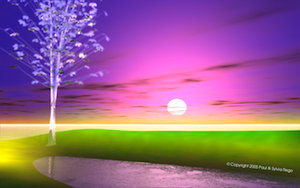 It will be common to see “day visions” of the new Earth. Not just in Meditations but during daily routines, some people will see glimpses of the new Earth. If someone’s frequency is far from the frequency of “the Event”, they will be dazed. For those who currently vibrate high-enough, when “the Event” happens, they will feel “happy, blissful waves all over their body”. For this Client, “the Event” will arrive from the East. After “the Event, some will be able to “walk between worlds”. There’s nothing to prepare for. It will be a massive “bliss-out”. After “the Event”, phones will be down. People will be forced to use Telepathy. “Negativity is scrubbed-out by the light.” People will be able to manifest whatever they want. Allison says the Higher-Selves have told every one of her Clients to stop eating sugar. This session had the most details. I only listed a few. So be sure to listen to the video, in order to see which facets resonate with “you”. Previous Previous post: PS 2-26-18 Cabal, Fulford, Hoffman, TheEvent? Next Next post: PS 2-28-18 *theEvent?, GeoMagnetic, PinkEarth?